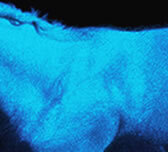 We have so many products your horse will love it's hard to know where to start. Sleazy Sleapwear to keep him tidy, Weatherbeeta blankets to keep him warm and dry, shampoo and grooming tools to keep him beautiful, and stud muffins horse treats for his sweet tooth are just a few. We carry turnout blankets and cooler sheets from Barnstable, Big D, and Weatherbeeta. We have halters, leadlines, boots, and wraps to coordinate with your stable colors. Health care products including supplements, wormers, calmatives, ointments, linaments, poultices, fly sprays and masks, and hoof treatments. 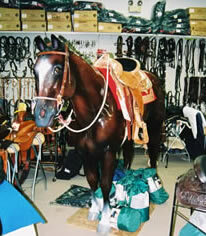 In short, we carry everything imaginable for the care and comfort of your most pampered equine.